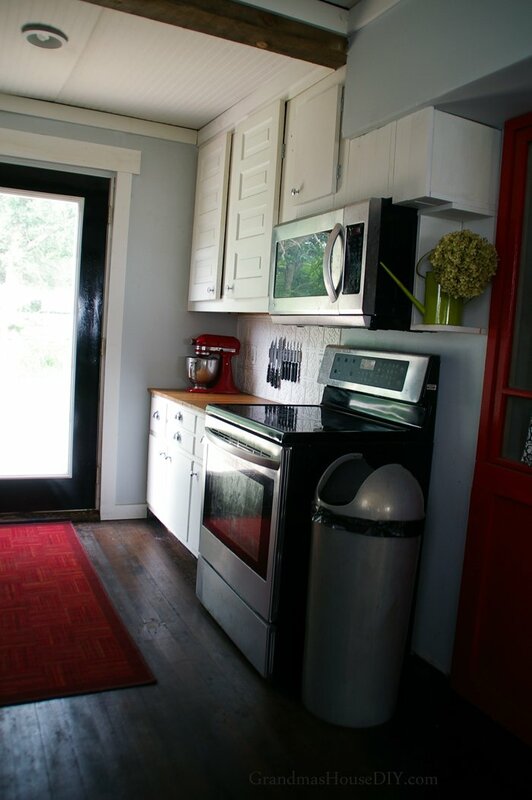 Our country kitchen design because kitchens are meant to be cooked in! 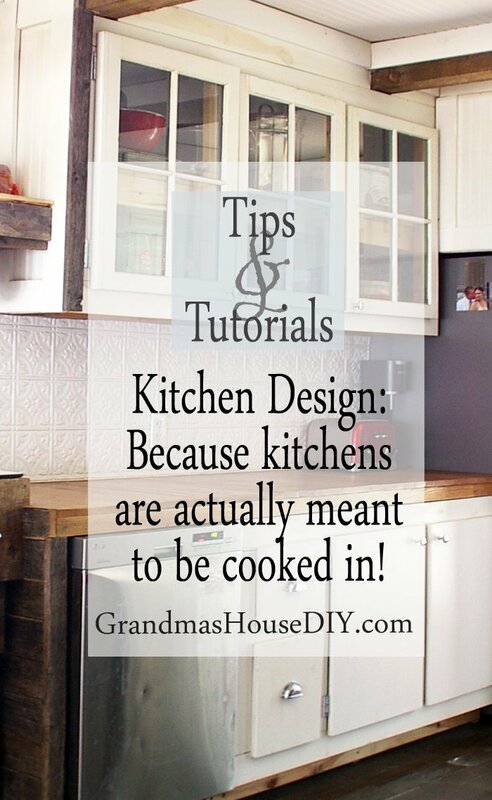 Because kitchens are actually meant to be cooked in! Prepare yourselves, this blog post is going to begin with a small rant about kitchen design: Somewhere along the way kitchen designers and cabinet makers realized that people liked symmetry. They started designing kitchens with main elements centered in the middle of cabinet runs. I have cooked in many kitchens and I am at a complete loss as to this design-over-function mentality that seems to be raging through this country like a wild fire. Who in their right mind would choose two counter tops on either side of the stove that are only ten inches wide as opposed to one on one side of the stove that is twenty inches wide? Seriously, you can’t even put a cutting board on ten inches! In a small kitchen especially, breaking up counters simply does not make any sense to me. So now you know why my kitchen is a literal tribute to long runs of counter space. I do not have a very big kitchen but if I want to roll out seven feet of dough or have three people side by side chopping vegetables I can do that easily and comfortably! You can see just at a glance that all of my appliances flank my counter tops. Every counter run I have ends at an appliance and there are no little, ittty-bitty slivers of utterly worthless counter space. Back in the day mothers used to spend the majority of their time in kitchens and a lot of that time was spent washing dishes by hand so a window above the sink made sense. We no longer live in those times so I made the decision to take the window back that I had purchased to put above my sink. Also, plumbing would have been A LOT more complicated (and I did all of my plumbing myself) so the window was returned. With a wall now above my sink I knew exactly what I wanted there and I think the open shelf entirely made up for losing that window. In fact, I would make this choice again in a heart beat, Joe and I use that open shelf EVERY day. I have been asked (especially by my own mom) if it doesn’t get dusty a lot. Yes, it does, but not as bad as you might think. Everything we put on that shelf we touch often so dust never manages to settle too badly. A design element I would never go back to is a knife block. I always had my eye on the magnet strips for knives and finally found one that was really affordable on Amazon. As soon as I got it home I installed it, goodbye knife blocks forever! 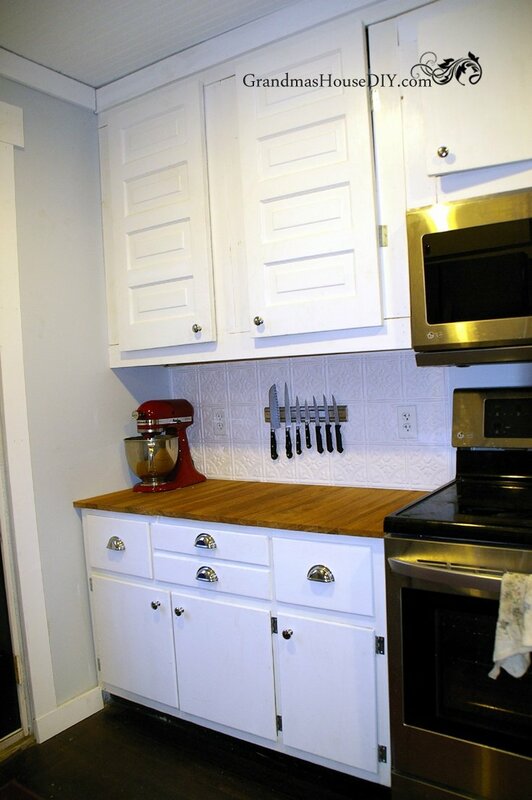 I would never go back, I hate having clutter on my counters and I love how our new magnetic knife rack looks. I have seen million dollar kitchens that I would never want because of poorly chosen back splashes. I see those rough stone back splashes and I see spaghetti sauce splatters that will be there forever. Back splashes are meant to protect your wall, they are there so you can WIPE THEM DOWN or, at least, that is what they’re supposed to be there for! My back splash is not real tin ceiling tile (as I’m sure you might have already guessed) it was as simple to install as literally just cutting it to size with a pair of scissors and then gluing it to the sheet rock behind it. 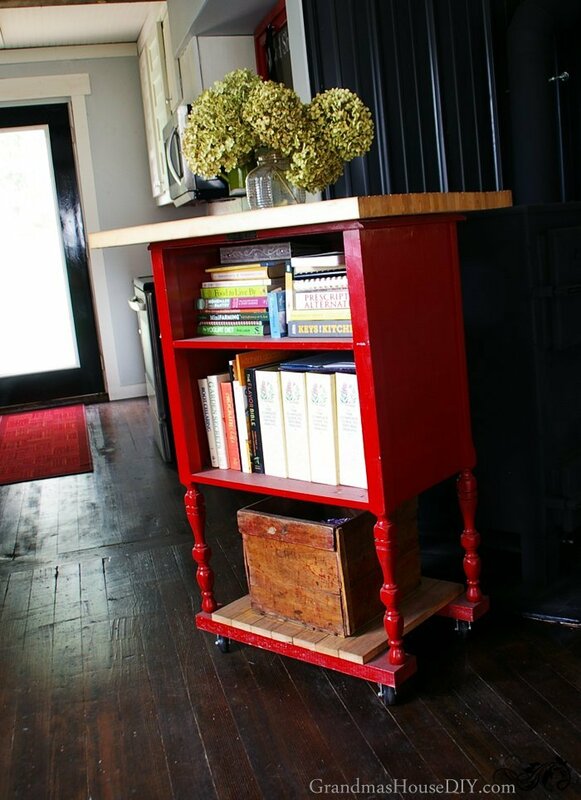 I think it’s really pretty besides being totally practical and functional, not to mention in keeping with my 100 year old home – click here to check it out on Amazon where I purchased it. Another design flaw that has absolutely driven me crazy in not one but TWO homes that I’ve lived in is the lack of thought put into giving a refrigerator enough space. If you put a refrigerator by a wall you won’t be able to open it very far!! And, with the ton of shelves and stuff on the inside of refrigerator doors these days, that means you can barely even get anything in it! Incredibly annoying. Because this is such a popular design problem people have finally figured out how to fix it with a tall (as tall as the refrigerator at least) and narrow (mine is only 8 inches wide) rolling pantry put in beside the refrigerator and the wall. 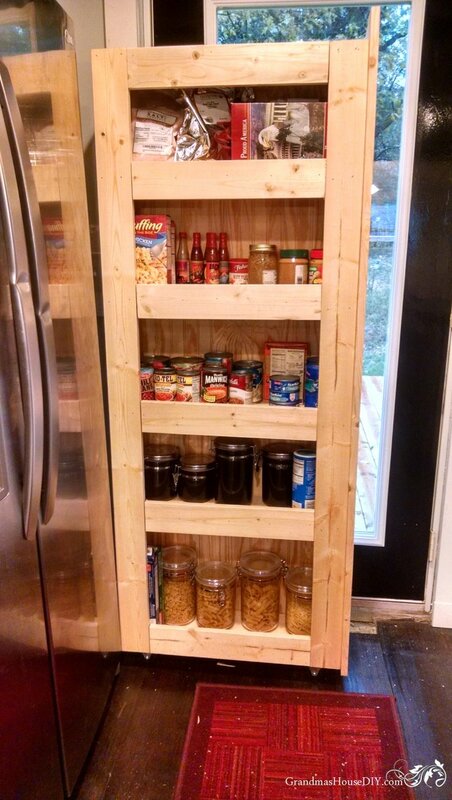 The depth of the pantry is several inches less then the refrigerator so, when it is fully slid away, the pantry allows the refrigerator to open in front of it fully. I actually wouldn’t live without this pantry again whether I needed it beside a refrigerator or not. This narrow cabinet literally manages to house ALL of my dry goods, pasta, rice, oils, canned goods, its all in there and much more. I have a post about building it here. I think we’ve all lived with the disgusting state that an under the sink cabinet becomes over time and that wasn’t something I was interested in. In fact, early on in the renovation I had already chosen my sink and knew that I would have no choice but to build a sink base to fit it. So I had a kitchen sink base in mind, something made with 4×4 posts because they would match with my kitchen’s huge square beams. 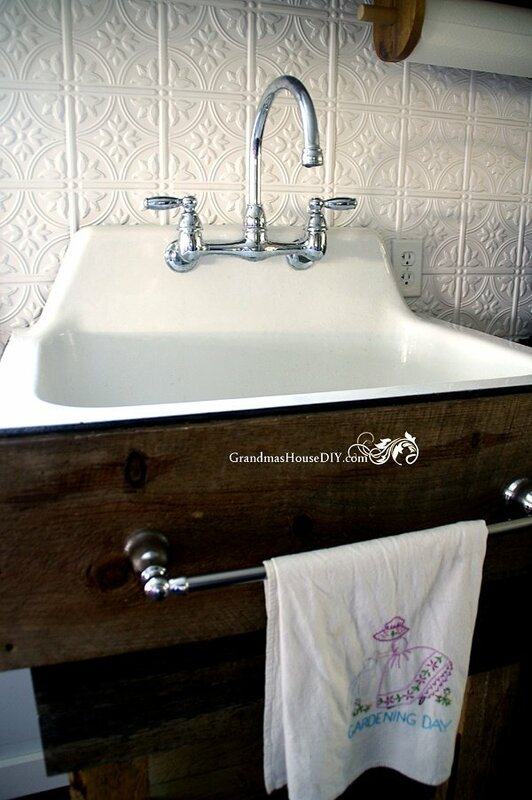 You can see more about it here: How I made my own kitchen sink base. I put in a shelf just beneath the drain for all of my kitchen soaps in a wicker basket and under that, in another wicker basket, I keep all of my onions and garlic. 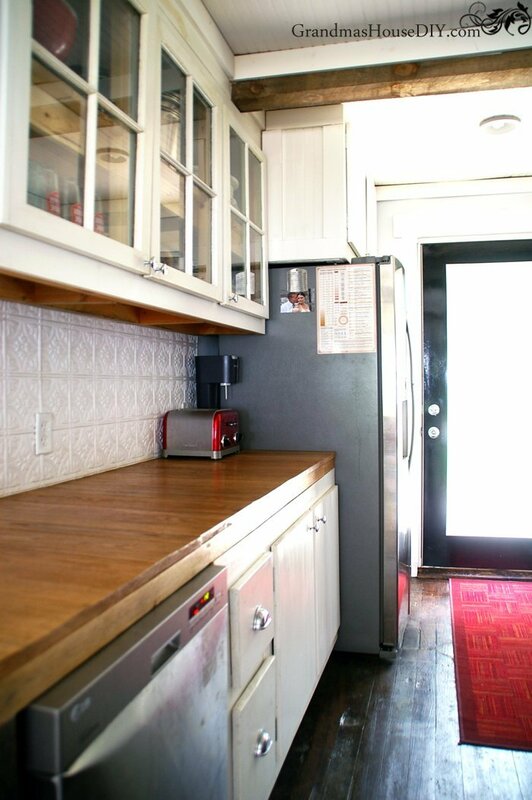 I just love your charming and imaginative kitchen. So practical yet so much character. Also I meant to say earlier happy anniversary! Nancy that’s so cool you used the same back splash! We’re really still very happy with ours! I love your kitchen and I think I may have to try that easy chicken salad you posted too, it looks great! I also bought a magnetic knife strip and mounted it under the upper cabinet next to the sink, easy to grab, use and wash! Yup I just love ours! I have a couple more really heavy duty ones for my workshop (whenever I finish it!!) for all of my screw drivers, can’t wait to put them up and use them! 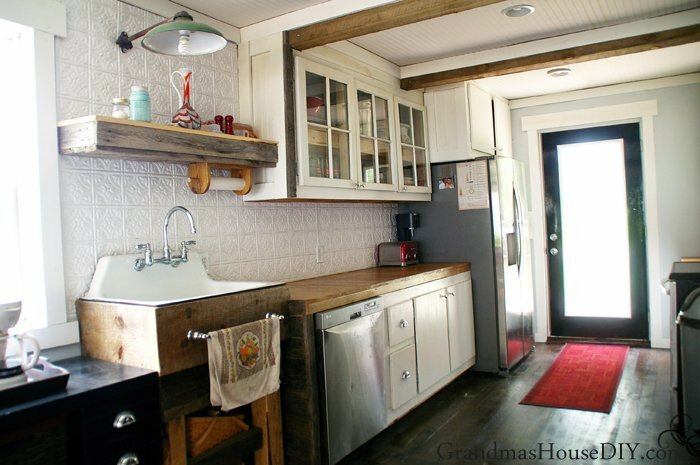 No doubt your Grandma would be very proud of what you have done with her kitchen and house. So functional and the fact that you did so much of it YOURSELF is so admirable. Good for you! I love the rustic design and feel to it. Your grandma would be so happy! What’s the inspiration? Kitchen remodels are the worst but totally worth it when you end up with a beautiful kitchen like yours. This is gorgeous and I’m in love. By the way, me and my wife also looking for good country kitchen design and luckily we found your post. Hey Alex, thanks for coming by! Yeah it was a TON of work but SO worth it in the end!